With holiday gatherings and the new year on the horizon, you’ve probably chosen the perfect party dress, killer shoes, and lipstick in just the right shade of red. Your outfit might be ready for all those holiday photos – but what about your smile? Believe it or not, there’s still time before those holiday gatherings to treat yourself to the gift of a brand new smile, and it doesn’t have to break your budget! Here are dental solutions that can transform your smile and overall appearance just in time for the holidays. A complete and harmonious smile transformation is possible with veneers. Veneers are thin shells of an extra-durable composite material that goes over your teeth to make esthetic changes in your smile’s shape, length, and color. Closing gaps in your smile. Fixing crooked teeth and/or a misaligned bite. Lengthening and reshaping your teeth to be more uniform. Harmoniously enhancing your facial features. If you are a candidate for veneers, your newly transformed smile can become a reality in approximately two weeks. Of course, every smile is unique, so you will want to consult with your dentist for your personal treatment schedule. Once you co-design your new smile, the composite porcelain veneers are custom crafted to match your eye contour, lip and nose shape, and skin tone. With proper hygiene and care, your new smile can function and look spectacular for up to 20 years. Prevent further decay caused by cavities. Avoid loosing teeth due to infection or extreme decay. Reduce the risk of needing a root canal later on. To replace old metal fillings or to restore cavities takes only one visit with your dentist. These tooth-colored fillings are made from an extra durable material (similar to that of porcelain veneers) that matches the strength and durability of natural teeth and mimics the appearance and tone of your smile. These restorations blend naturally with your smile and preserve its integrity for decades. Years of coffee drinking, smoking, or consuming wine can gradually discolor the enamel of your teeth. In these cases, even if you have regular dental cleanings and good brushing habits, your smile may still look dark or yellowish. Christmas or other holiday gatherings. In just one visit of approximately two hours, your dentist can brighten your smile painlessly and harmoniously. When compared to over-the-counter alternatives, professional teeth whitening with your dentist is the easiest way to amp up your smile’s potential. Our in-office whitening system brightens your smile in a much more uniform and natural-looking way than the typical whitening products sold at stores. When whitened professionally, your teeth will not suffer long-term sensitivity to hot and cold temperatures, as is often the case with over-the-counter products. Which smile transformation would you like for the holidays? The benefits of improved self-esteem and overall attractiveness last well beyond the holiday season. Your personal relationships and career also benefit from this transformation. Wouldn’t that be a great way to start the upcoming year? Whether porcelain veneers, tooth-colored fillings, or teeth whitening is the right solution for your new smile, we will create a personalized treatment plan specific to your needs and desires. 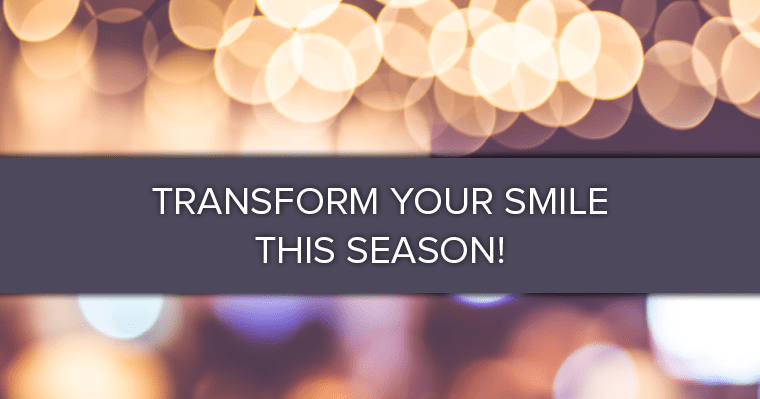 Enjoy the gift of a dazzling, sparkling smile this holiday season – you deserve it!